You have worked as a translator for the European Union. Just how many languages do you work with? I still work at the EU, but now I am a policy officer in charge of the Multilingualism Policy for the promotion of language learning. I used to translate from English, French, Dutch and Finnish. Our working languages are English and French and sometimes others, depending on the colleagues we have. What was it that first drew you to languages and translating? The curiosity to see other countries and to discover different ways of life and different mentalities. I used to feel oppressed always staying in the same place, culture and language. What are the similarities and differences you have encountered in the process of translating the words of others, and writing your own? Translation is a very powerful tool of comparison between cultures and languages. No misunderstanding or ambiguity is ever permissible when you put a text in translation. It has always been fascinating for me to see how national behaviours and mentalities are reflected in a language and how delicate it is to express this in another one. As a writer I have always been aware of the great responsibility that lies on a translator. Nonetheless I think that a translation is always possible and that a translator should not hesitate to change the original if this change is more effective to express the real meaning of a text in another language. Have you ever translated your own work? Would you consider it? No, I couldn’t. One is master only of his own language. I did spend several months in Finland to learn Finnish. It was a very exciting experience, because Finnish is completely different from any other language I had studied or “tasted” before. I really felt like a stranger there. Thinking about language and identity, I had the idea to develop this into something more profound and invent a story that could express my mixed feelings on language itself but also on how we perceive each other through language. In Europe we are many identities linked together by something deeper that we cannot grasp. I tried to explore this delicate subject without looking for answers but just for the sake of thinking about it. Do we really need languages to define ourselves? Do we have an identity despite language? Can we build one that is multilingual and European? These were my questions. And still are today. You transmit a deep love for language in your novel - particularly written language. The protagonist Sampo learns by reading and copying out phrases from the newspaper, the Doctor writes a commentary on Sampo’s notebook and letters from Ilma appear in the novel too. Was the idea of the written word central to the way you decided to structure the novel? Absolutely. That describes my personal approach to a language. I need words and sounds, they are the first things you perceive of a language. But then, at some point, I need the sign on the paper, the written word. Only when I master the written word I have the impression of grasping a language. Sampo’s efforts were also mine. There’s also a celebration of the way words sound, and in the figure of the priest we see an insistence that language be sung or pronounced. When you are writing, are you conscious of the way your prose sounds? I give a central role to sound in my writing. When a chapter is finished I need to read it aloud and check for the music of the text. It must have a rhythm, it must be musical. We must never forget that literature is a modern thing. First came poetry and poetry is music. New Finnish Grammar also explores the complex issue of language and identity. I noticed that apart from Sampo, there are a few characters who seem to be exist between national or linguistic identities. What’s more, the novel opens in Trieste, which has historically been an important meeting point for Italian, Germanic and Slavic cultures. Do you see Europe today as a place of hybrid identity? This is exactly the core of my research, both from a literary and from a political point of view. I do not have convictions on the matter. I simply try to understand how it works, how our identities were shaped, how can we change them and adapt this delicate component of our soul to the need of a united Europe. I think that today in Europe innovation comes from places of mixed cultures, from borders, from multilingual places. But these places until recently were considered peripheral, unimportant: places of suspicious contamination. The Europe of the nation-state was never keen on boundaries. Actually, it is the nation-state that invented them and that separated cultures through languages. Today the weakening of the nation-state allows a new Europe to take shape. But we still do not understand its features. It took over ten years for New Finnish Grammar to appear in English after it was first published in 2000 in Italian. Can we expect to see some more of your work in translation soon? Indeed, as The Last of the Vostyachs will be soon translated into English and perhaps also The Interpreter. These are my other two “linguistic novels,” in them I further explore the subject of language from other points of view. I tackle the topic of language minorities and language preservation: a very hot subject in Europe today. I also look at the eternal myth of the common language, in which I do not actually believe. My books are perhaps difficult for ordinary people because my topics are unusual and too modern. People do not usually bother about identity and languages, or at least they do not look for them in novels. But they are now faced with the important developments of the European Union, with migration and the mixing of cultures and languages. Many Europeans today believe their identity is threatened by diversity. They do not understand that identity is a process always on the move. Italians think they were always like they are now, for example. They do not understand that we have always been exposed to change, that change is our condition. Perhaps thinking about this subject, as I do, will be helpful and will bring about a new awareness. Right now I am working on a completely different kind of novel. I am writing the second adventure of an imaginary Vatican detective, Domingo Salazar, living in a modern theocracy, just like Iran, but Catholic. His first adventure was published in June and provoked quite a wave of criticism from the Catholic establishment. I’m looking for more! God’s Dog will be published in English in the UK in 2013. Diego Marani (Ferrara, 1959) is a senior linguist with the European Union. In his native Italian, he has published a collection of short stories and five novels which have been translated into several languages. He is the inventor of the hybrid European language Europanto. 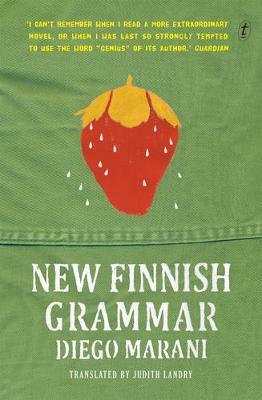 In an award-winning translation from Judith Landry, his novel New Finnish Grammar was published in November in Australia by Text Publishing. Text will also publish Diego’s second novel, The Last of the Vostyachs, in May of next year. The above interview was conducted via email in November 2012.